Birds are good barometers for the health of any environment. Alastair Wood takes part in the annual bird survey at the Coorong, the vast lagoon at the mouth of Australia's mighty Murray River, whose eco-system has for years been in critical condition. The internationally recognized wetlands of South Australia’s Murray Mouth, the Coorong and the Lower Lakes (Albert and Alexandrina) are home to a huge range of unique native bird, fish and plant life, as well as providing habitat for migratory birds from as far afield as Siberia and Alaska. Following years of drought, the salinity and acidity levels in the waters of the wetlands had reached lethal concentrations, however the floods of 2010/2011 brought a life-giving flow of much-needed fresh water into the Lower Lakes system. The mouth of the river, silted up for years, reopened and the barrages separating the fresh water from the waters of the Southern Ocean were opened up for the first time in many years. 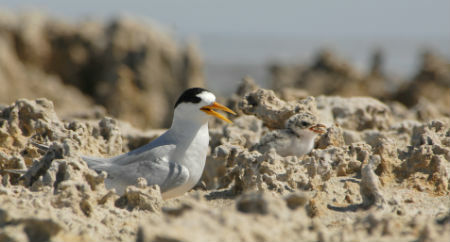 For more than two decades, a team from the Adelaide University’s School of Earth & Environmental Sciences has carried out an annual survey of birdlife in the area, counting waders and shore birds around the Coorong, Lakes Alexandrina and Albert, and the Murray Mouth, as well as carrying out terrestrial bird banding and small mammal surveys. Led by its heroic assistant professor, David Paton, the team comprises senior professional and other staff – permanent and casual, a range of undergraduate and post graduate students, and a few outsiders (parents, friends), myself included (a casual employee of the Uni). David began this venture 25 years ago, on his own initiative. He’s given up his annual leave every year since and together with his daughters Lydia and Fiona, arranges all the ongoing back-up, daily group deployments, catering and accommodation. The value of the data collected is as much in the 25-year span, as in any specific year numbers. It provides a significant barometer on a wide range of environmental indicators that unfortunately have been glossed over or ignored by successive Australian governments. 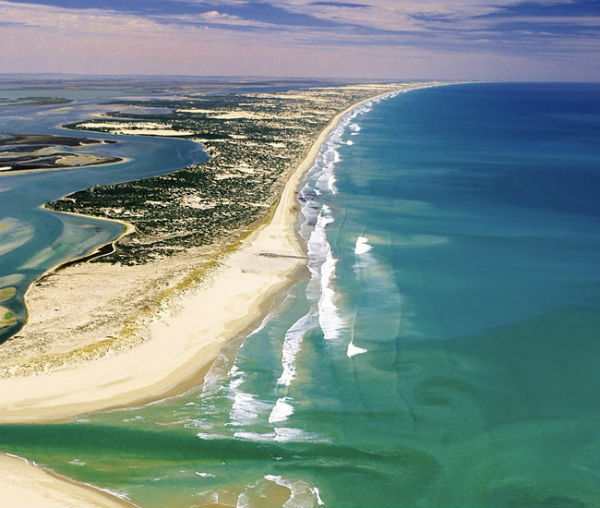 The Coorong’s long, shallow brackish lagoon stretches south from the Murray Mouth for around 140km running parallel to the coastal dunes. Heads down, hunched over, we pushed on, shouting to be heard above the racket of driving wind and flapping clothing. It was late afternoon and the summer sea breeze had hardened and blew with a vengeance straight up the Coorong. Ahead, the salty water of the south lagoon tapered into a slender tongue then disappeared. Pausing, we turned our backs to the wind to check on our colleagues, three undergraduates and a technician on the far shore, Younghusband Peninsula. Distances were hard to judge against the glare of the setting sun. They’d fallen behind and turned into a mirage; shimmering silhouettes in mid air, moving in slow motion along the edge of the lagoon. We meandered along the mainland shore, side by side, absorbed in our thoughts. There wasn’t a bird in sight. Eventually Colin stopped and peered through his binoculars. ‘A couple of stints –hardy little buggers!’ I focused my glasses. Sure enough, a pair of stoic little birds huddled together on the water’s edge, heads bowed into the wind. Strands of weed whipped past. With his back to the wind, Colin sank to his knees and pulled a folder from beneath his jacket. I moved upwind and stood behind him, a windbreak of sorts. Pages flapped wildly and threatened to blow away as he struggled to make the recording…Under the column marked ‘Red Necked Stints’, he entered the time, the number of birds observed and their attitude, which in this case was ‘resting’. It was the first day of the annual Coorong, Lower Lakes and Murray Mouth bird survey and it had begun with a long morning’s walk. A winding Coorong shoreline, north from the Ten Mile. The day got warm quickly as we scuffed along the water’s edge with the powerful stench of a zillion dead brine-shrimp in our nostrils and salt crusting white and hard on our city-slicker boots. The rotting shrimp formed an endless pile that stretched along the high water mark as far as the eye could see. By the time the 4WD appeared to take us home for lunch, we’d covered at least eleven kilometres. As the afternoon wore on our legs felt a touch sluggish. A mirage shimmered in the distance, beyond the tongue of water. It was a long way off. The southernmost transect in the month-long survey would be even further. So I lowered my head and pushed on, knowing it would be close to dark before we reached it. A crested tern wheeled downwind and was gone. Colin shouted something but it disappeared with the tern. I shrugged and kept trudging. After a while, I sensed a different sound above the racket. I turned my head to listen. A delicate lilting babble, high pitched but pleasant, floated in and out of the wind. A lovely sound, it grew louder, so I stopped and looked around. To the south, not a solitary bird in sight, nothing but windblown lagoon and hazy sandhills. But to the west, not that far away across the water, one of the biggest flocks of birds I’d ever seen! I grabbed Colin’s arm. ‘Check that out!’ I shouted, pointing. He nodded and we fumbled for our glasses. What a sight! Thousands of banded stilts in a flock that stretched for hundreds of metres along the peninsula shore. We took our time and glassed the flock from end to end. It was ever-moving. All birds were facing south, into the wind and all birds were busy. 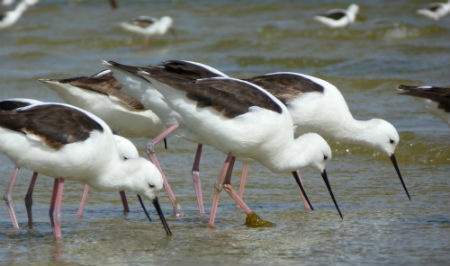 Many were foraging, knee deep, stooping on delicate long legs, heads moving from side to side as beaks probed the bottom. Others were content to preen and fluff their feathers. Those at the front, exposed to the full force of the wind, were never comfortable. With ruffled feathers, buffeted by the wind, they looked uncomfortable as they struggled to forage. They didn’t linger. With a slight opening of the wings they were lifted into the air in an instant and carried effortlessly over their fossicking colleagues, before fluttering down to a graceful landing at the back of the flock. In its lee, sheltered and comfortable again, they’d hardly started to forage again when others would float down and settle in behind them. It was a magnificent sight; a flock in perpetual motion. A fluid mixing of colours; of whites, blacks and pinkish greys – thousands of birds in a constant gentle rhythm. In the south lagoon, years of hypersalinity had killed off every living thing except brine shrimp. Introduced by unknown sources, the brineshrimp found a home and quickly reached plague numbers in a paradise with no competition. But this was good luck to the stilts! – the only bird that can tolerate such a salty diet. We put down packs, picked up glasses and set about counting. Starting at one end of the flock, we counted ten birds and let our eyes get accustomed to the size of ‘bird capsule’ they represented. Extrapolating that capsule ten times over, we counted a hundred birds, then extrapolating that ten times over again to get a thousand birds…. The trick is to count quickly and hope the birds remain still. To be able to make snap estimations when birds wheel and soar. The stilts must’ve known. As soon as I started to count they wheeled and flew in all directions, swirled, while groups settled and resumed foraging. A blur of birds. I didn’t get very far, getting just a few thousand before stopping and trying again. Counting was hard going, but I finally settled on seven to eight thousand birds. It was good practice, but it didn’t matter in the end. As it was on the far shore, the flock was the responsibility of the other group. My counting skills weren’t required, Colin kept the folder under his jacket and we pushed on. Later that night, as we lounged in the cool of the patio over a beer, I asked Lynn, an expert bird watcher who was on the far shore, about the banded stilts. He’d also had difficulties. Forced to make four separate counts as he approached the flock, he finally came up with twelve and a half thousand birds. I confessed my score and we had a laugh. In the past, when conditions were different and the estuary flowed as it should, this very same flock numbered about eighty thousand birds! But years of dwindling fresh water and skyrocketing salinities had stripped the south lagoon of food and the stilts flew away. Late the following afternoon we switched to bird banding in the scrub, not far from Salt Creek. The day’s heat had gone as our group of four walked back and forth in the lengthening shadows, looking for likely spots. Streams of bull ants swarmed along our paths, forcing us to stamp our feet and keep moving. Butterflies, dragonflies and locusts flew up from dry grass into our faces. We blocked off likely looking alleyways, natural corridors where birds flew between mallee scrub or boobialla with purpose-built mist nets. High slung, suspended between long metal poles, they resembled giant volleyball nets. Horizontal strings bunched them into loose-hanging bags that wrapped up flying birds with little impact or damage. Returning to the 4WD, we set up a bush ‘laboratory’ of sorts on a rickety card table set up beneath a mallee tree. Low key, out of sight we waited, while Lydia moved between nets, checking. But nothing much happened while the sun stayed high. A bronzewing pigeon caused a flurry when it flew into a net at speed, almost bringing the flimsy structure to the ground. But it bounced off and was gone in a flash, winging low through the bush. The sun had gone and the light was fading into dusk, when birds flew in all directions. We scrambled to man the nets, suddenly transformed into invisible lines of fluttering, struggling balls of feathers. Extracting them quickly and carefully, without losing many feathers, is a delicate and difficult art. It takes hours of practice, especially for those with large clumsy hands. 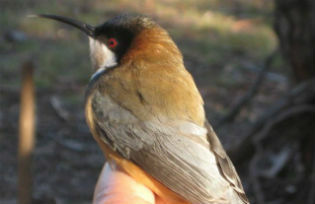 Scrub birds and honeyeaters have large bony feet and long toes. When threatened or trapped, they instinctively lock these around the nearest object, in this case the gossamer-fine meshes of the net. And it’s surprisingly difficult to release their grip before attempting to extricate the rest of the bird. Most birds lost a few feathers in the process before being stuffed headfirst into small cloth bags hanging from our belts. By the time we’d finished it was dead dark. Laden with bagged birds and netting gear, we blundered through cobwebs and spiky bushes and made our way back to the ‘lab’. Time wasn’t on our side. 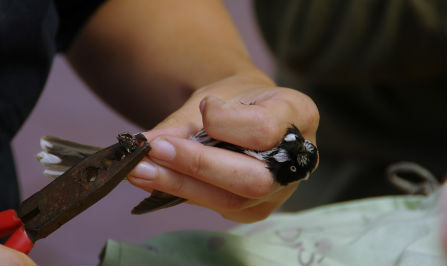 Birds had to be processed as quickly as possible and released back into the night. Working in the dark didn’t help, so the vehicle was manoeuvred to light the table and the team gathered around. We’d just got to work with scales and rulers when hoards of buzzing mosquitoes came out of nowhere and homed in, sending us scrambling for insect spray. Honeyeaters, finches, silvereyes and fairy wrens were weighed in their bags. Head length (including beak) was recorded and the first ten primary feathers examined. These gave a good description of the bird’s life; its age, general health and moulting history. A numbered/coded band was snapped around a leg and the bird thrown into the darkness. The scribe, cramped amongst cluttered gear, worked overtime, trying not to confuse the data called out by the assembly line. 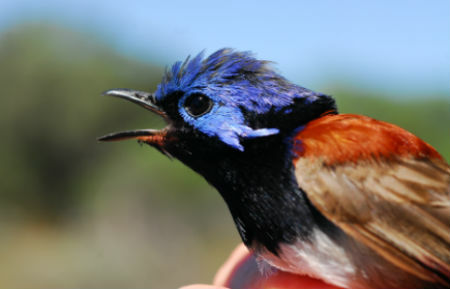 Honeyeaters were the stars of the evening – a purple gaped was recorded as were a number of outstanding ‘singers’. New Hollands were plentiful as well as silvereyes and a range of less colourful but more common scrub birds. Birds are good barometers for the environment’s health. The data collected that night is added to data collected over two decades. It is a valuable tool in managing the environment, helping to compile an accurate picture of the entire eco system. The survey also gathers data on small animals and mammals. 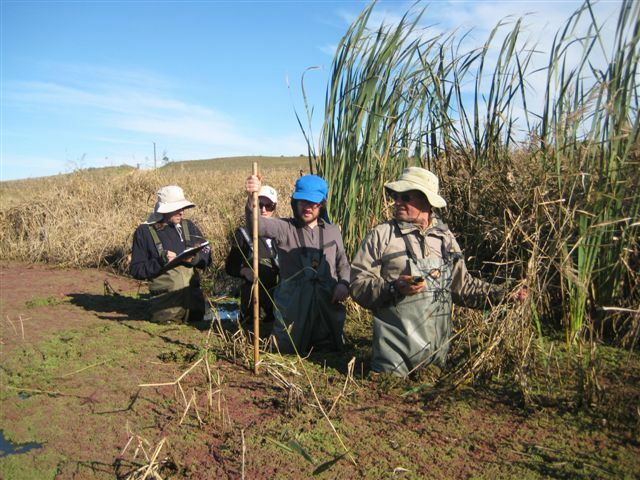 The following week we moved onto Lake Alexandrina, counting birds from a jetboat. A year earlier, the lake level was at an all-time low, with thousands of hectares of dried, sunbaked lakeshore making bird counting difficult. But after a year of abundant rains, the lake had filled to overflowing. Conditions were ideal for a shallow-bottomed craft to cover ground and get into all its backwaters. While the crew of two were kept busy watching and counting, the skipper idled the boat close to shore, plumbing for depth with a boat hook, creeping up on birds that gathered at the water’s edge. We headed north from Pelican Point late one afternoon, aiming to count the Narrung Peninsula shore as far as Point McLeay. The night before, I’d studied the map in detail and focused on the shore’s main feature, Loveday Bay, a large indent in the peninsula. I totted up the kilometres and calculated the fuel that would be needed. Birds were scarce as we left the Tauwitchere barrage, so I opened the throttle and kicked the boat along. A few kilometres later the first inlet appeared so I slowed her back to an idle and turned into a reed-lined canal. The day was sunny and warm, with a gathering sea breeze that kept the temperature down. I plumbed the bottom and found good depth as the boat idled past towering stands of reeds and rushes, close to our starboard side. Flocks of black duck and teal gave the boat a wide berth; flying off with a clatter of wings or swimming into the reeds. Another narrow entrance appeared ahead, so we headed through it, motor burbling. The counters, Phil and Tom, were standing on the seat, craning to get a look above the reeds. We continued on an easterly heading, scoring a few ibis and whiskery terns. The terns, delicate little birds, fluttered and dipped in our wake. In shallow, unknown waters, I was kept busy plumbing the bottom. We reached the end of the reed-lined corridor and a large lagoon opened up before us. Birds resting on the far shore were so far away they could only be identified through the glasses. We continued on at a steady idle as reeds gave way to flat open pasture and swamp. Our course had swung back to the southwest, heading for the barrage that we’d left behind over an hour ago. Loveday Bay was in the opposite direction. I glanced at the fuel drum on the deck. Another opening appeared. Barely wide enough for the boat, we eased through at the limit of our shallow draught. Black mud swirled in our wake as grebes crash-dived into the reeds. I looked at the fuel gauge and did some mental arithmetic. The counters were busy. Flocks of waterbirds dotted the far shore. It was flat, open country and small flocks of black duck, teal and ibis dotted the swamp, the surrounding pasture and straggly clumps of lignum. Most were resting but the ibis were busy foraging in soggy ground beyond the water’s edge. Great egrets and white-faced herons stalked in the shallows, making the occasional darting stab with their beaks. Data was accumulating on the sheets. I scanned the horizon, wondering how to find a way out of this wetland maze. We continued southwest; time slipped by. Yet another opening appeared in a shoreline of reeds and lignum. Depth was good and shadows lengthened. The compass heading swung back to the south as the narrow channel opened into yet another wetland lagoon. Loveday Bay and Pt McLeay were still ahead; many more kilometres of shoreline. My mind went back to the map. How could such a tiny section of simple black line on a map translate into so many endless bays and inlets? I shook my head and tried to block out the thought of being marooned in some distant backwater. It was time for a rethink. I cut the motor and the boat drifted sideways to a halt. While the reserve drum syphoned into the fuel tank, I discussed our options with the counters. We decided to cut and run. Get back onto a northerly course, glass distant shores as best we could and head for Point McLeay. By the time we had finished the Narrung shore and turned for Point Sturt, the setting sun was low across the lake and into our eyes. The sea breeze had swung back to the south and filled in. I was forced to throttle back as the boat punched into endless whitecaps, forcing the crew to huddle forward and escape sheets of spray that swept the deck. Bird work in winter is different. It’s a static, exacting exercise that focuses on individual sites (or cells) in strategic locations around the estuary. Such cells may be ephemeral; micro wetlands that are more part of a farm than a major water body. But when full, they are able to support colonies of waterbirds. Before the survey begins the team (4 or 5 people) spends time driving around in the 4WD, checking different locations. If all goes well and weather doesn’t intervene, it takes two full days to complete a survey for each cell. Before sunrise, the team leaves the warmth and comfort of the 4WD, rugs up, loads up and separates. Lone figures in the early morning light trudge out across paddocks, through swamps or along farm tracks to cover the one kilometre of shoreline that makes up the cell. Perched on cliffs or banks, anywhere with a good view across the shoreline, they slump into deckchairs and pull out data sheets. It is 7.30am and the first recording is due. Freezing fingers fumble with glasses. The sun rises and the glare off the water is straight into my eyes. A compact flock of silhouettes wing across the sky. I’m hardly awake, let alone organised. I scramble up for a better view, sending data sheets and pencils sliding into wet grass. I can see they’re shags, but what sort? Nothing but blinding light and black shapes that quickly fly out of range. No glimpses of colour, or distinguishing marks. I make a mental note that they’re greats, but have a niggling suspicion they could be pieds and sweep the glasses downriver, just as a bigger flock disappears into the glare zone. My heart sinks; hundreds of shags are heading upriver and I haven’t counted a bird yet…..
After this brief flurry, the early morning traffic drops off. A silence settles over the water. Sharp calls of purple swamp hens and gentle buzzes from golden-headed cisticolas come from deep within the reeds, but these birds are invisible. I take a punt and score them as ‘resting’. Birds must be counted and their attitudes recorded on the data sheets every five minutes. It’s quiet along the shore and out across the water. Not a bird in sight. Regardless, I must remain here, in this one small spot, alert and on duty, all day. I look at my timer and it’s 7.45am. There’s a hell of a lot of five minute intervals until last light of day…. My mind convulses then goes blank. The first day is the easy one, sitting still and observing birds. The next day is spent trudging through the shoreline’s boggy soils gathering detailed data about the habitat. Transects must obey the GPS and are followed from shore to a water depth of eighty centimetres. The GPS is God. If it points through the thickest stand of reeds, or inpenetrable patches of lignum, that’s where we must go. Tom, the bearer of the GPS, is next to God and leads the way. The rest of us ordinary mortals follow in a line astern. It’s another early start; we clamber into waders and wet weather gear, abandon the vehicle and trudge to the first transect. Correctly predicting the day’s weather before the sun is up is a big bonus. With twenty transects to do before dark, we’re on our feet and on the move all day and wearing too little or too much can become a problem. So can leaky waders. Slogging our way through shoreline swamps in clumsy waders can be testing. The boggy bottom, potholed and churned up by grazing cattle, is covered with thickly matted grasses. At every step we may slip into a chasm or topple over an invisible peak and end up on our moosh in the slush. Same with reedbeds and lakes. Shuffling through murky shallows, lurching and off balance, we never know when we’ll strike a rocky outcrop and end up in the drink. The trick is to attempt to walk like an Egyptian – lean back, slide your feet along the bottom and let them feel out a safe path for you. It’s not much fun to go for an early spill in the freezing water and spend the rest of the day in sodden clothing. 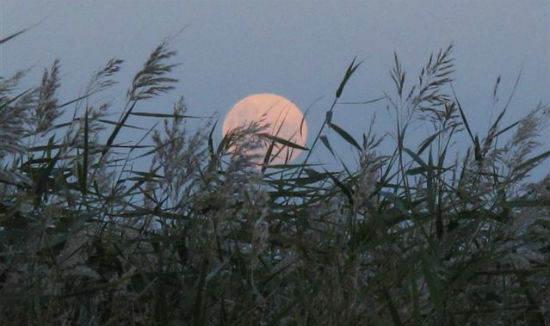 Reedbeds are deceptive, but look innocent from the shore. But once inside them they’re a different matter. They can be stacked so dense and high with towering stalks and matted material that there’s only one way through. Those in the lead have to throw themselves at the wall, bodily and crush it down beneath their weight, before clambering over and making a path for the others to follow. As they follow the GPS line, the team is fastidious about recording all aspects of plant life and water quality along the way. Digital cameras are whipped out at the drop of a hat when an unusual or unknown plant is found. Waist deep in ooze, we gather around, examine it from all angles and pull out reference books. Time ticks by. We thumb through endless pages comparing this plant against that plant, debating the correct identification before making a recording. For the team leader, the day never ends. After dinner, while the rest of us lounge by the fire or fall into bed, he settles down with the day’s sheets and writes up data until after midnight. And he’s always first out of bed in the morning to rouse the troops. Alastair Wood was born in Adelaide, South Australia. After leaving school he spent a year in Canada where he tramped the Rockies of British Columbia fishing for the magnificent steelhead trout. On his return to Australia he attended Adelaide University and graduated in economics. In 1970 he purchased a marine scale fishing licence and fished for mulloway in the surf along Younghusband Peninsula. In 1976 he was featured in an episode of the ABC’s ‘Big Country’ and in the 1990s was involved in an aquaculture program that pioneered the breeding of mulloway in captivity. He is the author of two books: “Of Billabongs and Broken Dreams” and “Poor Man River”.